The following is a guest post on how minimalism is not the solution to organization from regular contributor, Morgan from Morganize with Me. The minimalism theme has been getting lot of buzz lately. It’s become somewhat of a lifestyle and something many homeowners aspire to achieve. The idea of being a minimalist means having less, choosing quality over quantity, and curating rather than collecting. While these are all good things to do, they will not necessarily make a home organized. 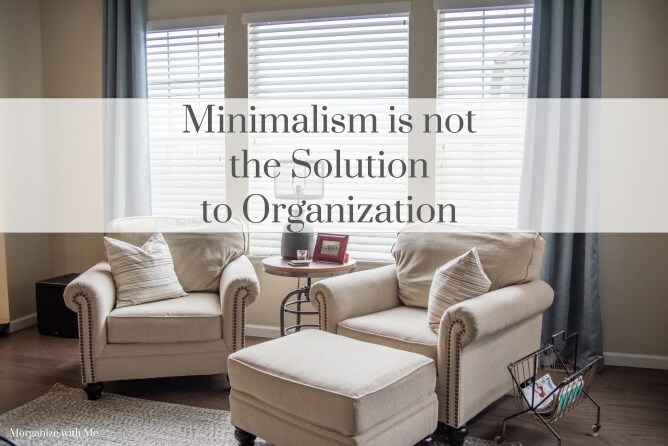 Minimalism is not the solution to organization. The principles of minimalism are good principles to adopt. Being more intentional with what you buy, own, and keep does help to prevent the tendency we all have to over accumulate. However, there seems to be a misconception that if you just declutter, donate, and ditch enough things that you’ll then naturally have an organized home. But that’s just not the case! A minimalist can still be an unorganized minimalist. You may have less stuff and therefore less piles, but you can still be disorganized. My recommendation is that you use the elements of minimalism to help with what you keep and own (your number of belongings) and then still commit to working daily to stay organized. 1) Tidy like it’s your J-O-B! Every time you move from one room to another room, take something with you. If you get home, bring in everything from the car. When you remove your shoes, put them away. If you take off your coat, hang it up on the hook. If you go up the stairs, take a load with you. The more you tidy as you go (or whistle while you work) the more you’ll keep up with putting things away (where they belong). Tidying up is a daily necessity! If you tidy like it’s your job, your job of organizing will get done time and time again. 2) Take a seasonal inventory. Different seasons of your life require different amounts of stuff. If you are currently raising children you probably have more stuff in your home just because of your kids and their specific needs. Keep in mind that children outgrow things quickly, so it’s important to not over buy for them and then even more important to declutter their things on a regular basis. When a new season arrives (like back to school or spring break) it’s a great time to declutter. Likewise, if you are entering a new season of life yourself, such as empty nesting, downsizing or relocating, this is an optimal time to take an inventory. Life seasons change, your needs change, and what you must keep will also change. Regular, organized inventories will help you to better stay organized. 3) Timers are your friend. To maintain your home’s organization and get through your daily to-do list, use a timer! Just 10 minutes spent organizing a space will help you to get a lot done. (As long as it is 10 minutes of focused organizing.) Which is the same for any home or work task that needs your concentrated efforts. Never underestimate the power of having a bookend on your time and/or project. It takes time to be organized, so make your time count! Again, I encourage you to still minimize what you own but then make a point to organize every.single.day. The more you tidy, take inventory, and use timers, the more effective you will be with staying organized! Interesting. I think this is true. 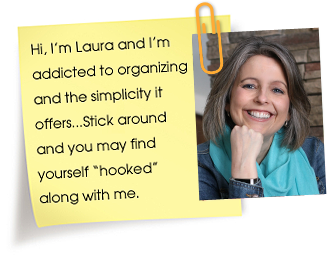 You can be a minimalist and be either organized or disorganized. I do think that having less makes it easier to be organized, but you still need to work a system, right? Got me thinking this morning! Good ideas…tidying as you work through the house. I work on that a lot…see something that’s needed elsewhere goes there with me. My issue with a job of clearing out a space, I wind up walking around too much to put things away. I need to get it all together for a room and then take those few items into that room. I downsize a few things, especially when it’s no longer needed. Good to do that now that I’m older and don’t want my children to go through everything when I’m gone or my husband. My mom had many things but she had drawers that were organized. I did keep some things but many things went away afterwards.